High Speed NVMe PCI Express Gen3 x2 Interface: Up to 1600 MB/sec sequential read speeds for performance 3x faster SATA SSDs. 3D NAND: State-of-the-art, high-density 3D TLC NAND offers the ideal mix of performance, endurance and value. Compact M.2 2280 Form Factor: Ultra-compact M.2 2280 size fits directly into your notebook or motherboard with no additional cables or connectors. Multi-platform OS Support: Compatible with Microsoft Windows 10, Mac OS, and Linux with no special driver or administrative rights required. Enhanced Error Correction and Wear Leveling: Advanced error correction and improved data retention ensures your data is safe, while static and dynamic wear leveling enhances reliability and extends drive life span. CORSAIR SSD Toolbox: Configure drive over-provisioning, Secure Erase, disk cloning, firmware updates and more, all from your desktop. Pros: After conducting two (2) weeks of extensive research, I decided to purchase the MP300. Desired the B+M Key to get full use of the specifications. It's worth the purchase and upgrade. There is an increase in performance. Passed all test for normal day to day computing using Windows 10 Pro. There is no lag in performance, just a steady flow. Laptop run very cool using this MP300. The CPU is happy to perform with a M.2 SSD that can stretch the performance. MSI Intel i7-7700HQ with optical drive using two (2) SSD. Corsair Force MP300 does not get hot. NVMe drivers are loaded helping out with operation. 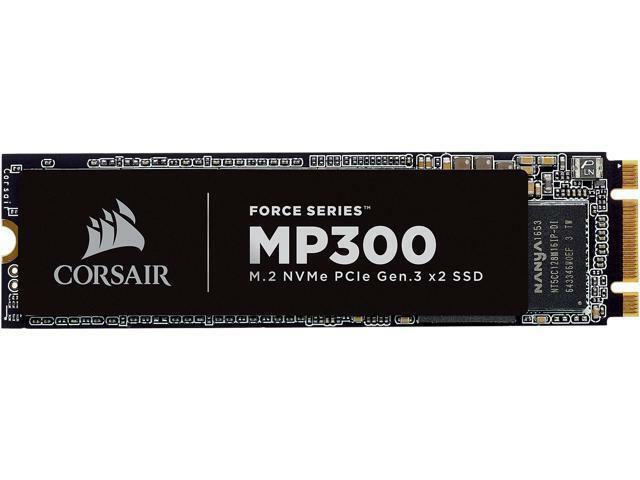 Faster than a M.2 Sata III B+M Key without the NVMe x2. Work with Linux. Not software required to download for Windows or Linux. Cons: Not a full 1TB. Not an x4 PCIe NVMe. Other Thoughts: Good purchase and would definitely buy another.